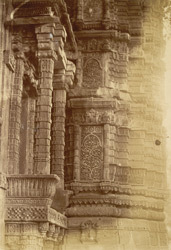 Photograph of carved panels on the minarets of the Nagina Masjid at Champaner, taken for the Archaeological Survey of India around 1869. The ruined city of Champaner is situated north-east of Ahmadabad. It was a stronghold of Rajput kings until the Sultanate ruler Mahmud Begarha (r.1458-1511) took the city in 1484. The Nagina Masjid, or Jewel Mosque, dates to the mid-16th century and is situated just north of the citadel. It has a similar plan to the Jami Masjid but on a smaller scale. This view shows the carved bands and niches filled with floral designs on the lower section of one of the minarets.